The Design-Build process by Nautilus Luxury Homes provides you with a single entity to bring your dream to life in a way that is collaborative, inspired and done to exacting standards. Master builders have built some of the most impressive custom luxury homes throughout history and today utilizing the Design-Build concept. In a traditional build process, your home would be designed by a separately contracted architect. You would then contract a builder who would attempt to budget and construct your dream home based on plans and specifications that might be incomplete or unrealistic. Design-Build creates an singular-vision environment where the designer, builder and homeowner become a team, all working toward the same goal — your custom luxury dream home. When you decide on a construction process that is quickly gaining popularity in the United States, you may think of it as a trend, until you understand the multiple benefits it offers over traditional building processes. Nautilus Luxury Homes becomes your only source of contact throughout the entire design/building process, giving you peace of mind and a single perspective. From architectural drawings to the building warranty after construction, we become the only contact you need. This holistic perspective provides a positive environment for the design and building phases of your custom luxury home. With many building projects, what you envision may need to be tweaked, changed or considered for its cost implications. With the Design-Build process these issues are eliminated, as architect and builder are one and the same, ensuring every idea is feasible before the build, and according to your specifications and budget. This collaboration of owner, builder and design architect all lead to a process that has proven to lower overall costs, limit budget overruns and ensure on-time delivery. According to the Construction Industry Institute’s most recent research, delivery speed can be up to 33 percent faster with a 6 percent lower cost over the traditional design-bid-build model. Lastly, since you only have one point of contact, Nautilus Luxury Homes is solely responsible for the success of your custom luxury home; which we guarantee to your satisfaction. 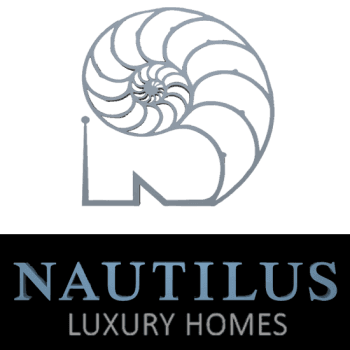 With Nautilus Luxury Homes you are invited to a consultation with key members of our team. It is at this early stage that we lay the groundwork for building your custom luxury home. We take the time to listen to your ideas, your vision for your upscale home and design requests. The best approach is to listen to you, and take notes of your preferences. It is at this time that your goals, a building timeline, and overall proposed budget are outlined. As early as this point, our team can assess the reality of matching these goals, and give you an optimal response for moving toward achieving your custom luxury home. After the initial consult, we further the research process by ensuring all necessary background information is collected. This includes sourcing material requests you may have for special projects, the feasibility of additions and amenities you want, and researching the existing site you have chosen, including its conditions and local building codes for permits. From the first two steps, our custom home builders are able to provide a rough schematic outline of your custom luxury home including initial design concepts and drawings as well as an approximate budget, scope of the project and estimated delivery time. From these initial approvals on main design concepts, our designers and architects move on to preparing the actual construction documents and drawings needed for permit gathering for the project. Finally, the interior design team can put together a comprehensive outline of the interior of your home. This can include major design attributes such as kitchen design and layout, to the smaller design choices such as door handle choices, tiling colors and even window dressings. Lastly, Nautilus Luxury Homes presents a finalized budget, construction timeline and scheduled delivery for approval. The construction phase of the process encourages weekly on-site meetings with our team to ensure every step is taken to offer changes when, and if, they are needed or wanted. This allows instant communication to change those little on-the-fly changes that arise in the building process. With a Design-Build home warranty, you also receive a final walk-through to ensure we have met your exacting standards. With a beautifully constructed custom luxury home that has brought you, the owner, into the process and provided consistent feedback opportunities, your luxury dream home becomes a reality with less stress and more inspiration.